We’re back! Our weekend trip to New Orleans was short and sweet. We had a wonderful time and got a little taste of New Orleans. I have to admit, I was ready to come home on Sunday after walking in the heat and humidity for a few days, but I have a newfound desire to learn as much as I can about this fascinating city. I received a plethora of recommendations from blog readers and friends and we just didn’t have time to fit everything in, but that gives us a reason to go back. We had wonderful food everywhere we went, took in the interesting architecture, and visited some fabulous shops on Magazine Street. I was fortunate enough to meet and chat with Valorie of Visual Vamp and Bryan Batt of Mad Men! I’ll share more about them and the fantastic shopping in the Garden District soon. I really struggled with where to stay while planning our trip to New Orleans. There are so many historic properties, but I cannot deal with chintzy interiors. I just can’t do it. I knew that we wanted to stay in the Quarter since it was our first time visiting NOLA, but the challenge was in staying off of Canal Street and keeping some distance from the raucous Bourbon Street. By the way, Bourbon Street was so not our scene! We walked down there in the late afternoon on Friday and were literally grossed out by it. There are drunk people everywhere, strippers who look underage in the doorways of their clubs, and a lot of unsavory characters. We even had a guy do the “I bet I can tell you where you got your shoes” bit on us. Ugh! We did however, enjoy drinks at Pat O’Brien’s on St. Peter Street that evening. It had the “New Orleans Institution” atmosphere without the sleaziness. Anyway, back to the hotel search. I know that I asked for hotel recommendations on La Dolce Vita and so many of you suggested the W Hotel in the French Quarter, that we decided to book it. We absolutely loved the W! 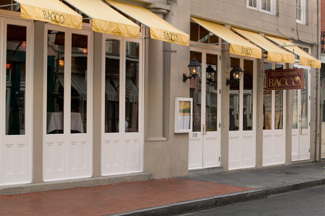 The service was outstanding, the location on Chartres Street was excellent, and our room was very stylish and comfortable. In the coming days, I will share more of our trip including New Orleans architecture and visits to the fabulous shops on Magazine Street, so stay tuned! Sounds like a great getaway. W hotels are pretty reliable and this one looks like no exception. Like when hotels have small touches like the notes and snacks. Looks like you had a great time! My favorite pic is of the elevator waiting area! So glam! Years ago, when I was in NOLA for my very first JazzFest (seriously, go back for JazzFest...the Quarter is wonderful during JF), my mother called me told me that when she was there in the 60s (registering voters), she went to Pat's and had a Hurricane. She said it as if these were secret things. It was so cute. I try to have a hurricane at Pat's every time I go, just to think about possibly being in the same place that my mother was almost 50 years ago. What a gorgeous hotel! This is one of my all time favorite cities. My boyfriend has never been so I've been dropping not so subtle hints ever since we met that we should make the trip down. Maybe I'll share your New Orleans posts with him! So glad you enjoyed the W and your Nola trip. Can't wait to hear all about your experience! The remodel is nice. I stayed there in the summer the year of Katrina. The courtyard furniture was an off white color with like colored candles and lanterns everywhere!!! It was very sensual (esp @ night) and contributed to the W vibe. The rooms had an shagreen like wallpaper (never could find out who the manufacterer was) and the bathrooms were exactly the same as your pictures. I loved the W!!! Beautiful! Looks like such a lovely place to stay, it's nice to see you had a wonderful time. Welcome home! I absolutely loved visiting New Orleans when Pete lived there during college, I remember by the end of senior year Pete was SO ready to get out and never look back, and now we both miss it so. I think we might need to plan a trip back soon. There is something about New Orleans that really feeds nostalgia, don't you think? Great photos! I just love New Orleans!! And I'm totally staying at the W -- it looks awesome! There's a romance about NOLA like no other place. It sounds like yall had a grand time. The W looks like a great place to stay. It will be fun to hear about the rest of your trip. So glad you visited Hazelnut and met Bryan Batt! How cool is that? My husband and I are so fortunate that our daughter is moving to NOLA in August to attend Tulane. Cannot wait to read you next installation! Do try Lillett on your next Magazine St. next visit. I think my daughter and I will have a wonderful time furnishing her first apartment!!!! i have always wanted to visit New Orleans. Has a reservation the day before the hurricane! Now I will know where to stay! It was wonderful to meet you and Fabian! Thanks for stopping by perch, on your whirlwind tour. Glad you got to meet Bryan too. Please come back and spend more time with us. I've heard mixed reviews on this city (I've never been!). Some say that it's absolutely not what they expected (the "sleazy" aspect)...but that the food is amazing, and some rave about the city...and the food too:). I think I need to go and see for myself! The husband and I are heading to New Orleans this weekend for a wedding in St. Louis Cathedral, we are so excited! I would love to hear more about where I should venture off too. Looking forward to seeing all those post this week! Love that bathroom & courtyard. Hopefully it was bustling with hip & cool guests to mingle with as well! Looks like a fabulous weekend! I love the W in general, but one of favorite ones has been in the French Quarter as they nicely combined the cultural with the modern. I had a little getaway with my husband a couple of years ago and room 305 was delightful, it had french doors facing the courtyard and again at the end of the room; which led to a private/romantic patio. I would love to go back. It looks like to had a lovely time! I just got back from New Orleans last night and I remembered you posted about the city, so I came to check back what you wrote. I could not agree more with Bourbon street. I swear I almost puked. It's pretty raunchy. I can only imagine just how more gross it gets during Mardi Gras. And my husband totally fell for the, I bet I know where you got your shoes from line! I laughed when I read it in your post. Oh man. Perch was wonderful and just about loved everything on Magazine St. Great, great city.